Anger provides the No. 1 difference between a fist-fight and a boxing bout. Anger is an unwelcome guest in any department of boxing. From the first time a chap draws on gloves as a beginner, he is taught to "keep his temper"-never to "lose his head." When a boxer gives way to anger, he becomes a "natural" fighter who tosses science into the bucket. When that occurs in the amateur or professional ring, the lost-head fighter leaves himself open and becomes an easy target for a sharpshooting opponent. Because an angry fighter usually is a helpless fighter in the ring, many prominent professionals-like Abe Attell and the late Kid McCoy- tried to taunt fiery opponents into losing their heads and "opening up." Anger rarely flares in a boxing match. Different, indeed, is the mental condition governing a fist-fight. In that brand of combat, anger invariably is the fuel propelling one or both contestants. And when an angry, berserk chap is whaling away in a fist-fight, he usually forgets all about rules-if he ever knew any. That brings us to difference No. 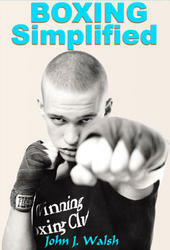 2: THE REFEREE ENFORCES THE RULES IN A BOXING MATCH; BUT THERE ARE NO OFFICIALS AT A FIST-FIGHT. Since a fist-fight has no supervision, it can develop into a roughhouse affair in which anything goes. There's no one to prevent low blows, butting, kicking, eye-gouging, biting and strangling. When angry fighters fall into a clinch, there's no one to separate them. Wrestling often ensues. A fellow may be thrown to earth, floor, or pavement. He can be hammered when down, or even be "given the boots"- kicked in the face-unless some humane bystander interferes. And you can't count on bystanders. A third difference is this: A FIST-FIGHT IS NOT PRECEDED BY MATCHMAKING. In boxing, matches are made according to weights and comparative abilities. For example, if you're an amateur or professional lightweight boxer, you'll probably be paired off against a chap of approximately your poundage-one who weighs between 126 and 135 pounds. And you'll generally be matched with a fellow whose ability is rated about on a par with your own, to insure an interesting bout and to prevent injury to either. If you boast only nine professional fights, there's little danger of your being tossed in with a top-flighter or a champion. The eight weight divisions in boxing-heavyweight, light heavy, middle, welter, light, feather, bantam and fly- were made to prevent light men from being injured by heavy men. Weight is extremely important, you know; for moving body-weight is punch. However, when a man is a heavyweight (more than 175 pounds) there's no top limit for him or his opponent. Remember: Willard, 245; me, 180. It's unfortunate that in fist-fighting, destiny or luck makes the matches. Chance picks your opponent for a fist-fight regardless of size, weight, age, strength or experience. Nearly every chap has had the unhappy experience of being practically forced to fight someone larger than himself at some time in his life. A fourth difference is: THE DISTANCE OR ROUTE. Modern boxing bouts are scheduled for a specified number of rounds, with a minute of rest between. In case neither contestant is knocked out or disqualified during the bout, the winner is determined by the number of rounds won or by the number of points scored. When a fist-fight is started, however, it is informally slated to a "finish." There is no let-up, no rest, until one scrapper is knocked out or beaten so badly he quits. You don't win a fist-fight on points. Sometimes friends or the police halt a street scrap, but such interference cannot be counted upon. When a fellow squares off for a fist-fight, he should be geared to finish it. He must make his own "distance," his own "route." Difference No. 5 is: FOOTING. In the ring boxers enjoy the best footing that technicians can devise. They glide about on the firm, level surface of ring canvas. Chances of slipping are reduced to a minimum by the use of soft-leather boxing shoes; powdered resin is sprinkled on the canvas, and then the resin is ground into the soles of the shoes. Naturally there are no obstacles over which a boxer can trip, or over which he can be knocked (except, of course, the ring ropes). The footing in fist-fights is a gamble. Fights occur usually where they flare up-on playing fields, streets, roads, ship decks, or in stores, offices, factories, saloons, dance halls, etc. And a fellow performs in whatever shoes he happens to be wearing. He fights upon whatever surface chance has placed him, regardless of slipperiness, rocks, boxes, tin cans, and the like-and regardless of tables, benches, desks, chairs or other large obstacles. If a chap slips, trips, or gets knocked over something, he may strike his head against an obstacle, or against floor, sidewalk or curb. Many deaths have resulted from falls in fist-fights. Let me suggest that any time you are about to be drawn into a fight, keep your head and make a split-second survey of your surroundings. Decide immediately whether you have fighting-room and whether you have good footing. If you haven't, try to force your opponent to shift to another battleground, where your knowledge of fighting will leave the percentage in your favor. Yell at him, for example: "Okay, wise guy! You want to fight! Let's see if you've got the guts to come out into the street and fight me like a man!" In 99 out of 100 cases you can force the other guy to move to an open spot by challenging his courage to do so. Don't let the action start in a crowded subway car, in a theater aisle, in a restaurant, office, saloon or the like. Keep your head and arrange the shift, so that you'll be able to knock his head off when you get him where you can fight without footing handicaps. In concluding the differences, remember that your face can be cut much more quickly by a bare fist than by one encased in bandages and padded glove. 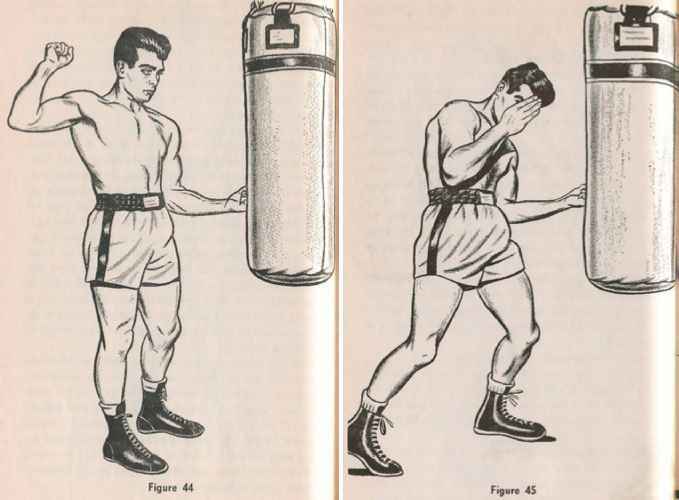 From another angle, the boxer-with fist protected by bandages and glove-has less chance than the bare-fisted man of breaking a hand-bone or smashing a knuckle, in case the fist lands squarely on forehead or elbow. Those major differences add up to one important total or conclusion: THE POSSIBILITY OF GETTING HURT IS GREATER IN A FIST-FIGHT THAN IN A BOXING BOUT. FIST-FIGHTING IS GENERALLY MORE DANGEROUS THAN BOXING. In connection with that danger, never forget: The longer the fight lasts, the longer you are exposed to danger. Moreover, the danger percentage against you generally increases with each passing minute of the fight. When you square off, you hope to beat your opponent into submission in a hurry. But, as the fist-fight continues, you find you are not achieving your quick victory. You discover you are beginning to tire because of your exertions and because of your tension. Since you have no chance for rest periods, the longer you fight the more tired you become. True, your opponent also may be getting fatigued; but you can't be certain about his exact condition unless he's blowing and staggering. You know for sure only that you're nearly "all in," and that he's still out there swinging at you. Accordingly, the longer he keeps fighting, the less chance you have of winning; but the greater chance you have of being battered, cut up, knocked down, knocked out, or injured. Because of the danger in a fist-fight, it is imperative that you end the brawl as quickly as possible; and the best way to do that is by a knockout. The knockout is far more important in fist-fighting than in boxing, YOU'VE GOT TO KNOCK 'EM OUT IN FIST-FIGHTS.